So Debbi and I got married! We’d been talking about it and then planning it since last summer. For my part, I think the stuff with my Mom over the last few years made me think more seriously about it, in case something happened to one of us the other one would have some rights to care for them. Plus we’ve been together for 14 years, so it’s not like we rushed into it. Exactly 14 years, in fact, as April 30 is our dating anniversary. 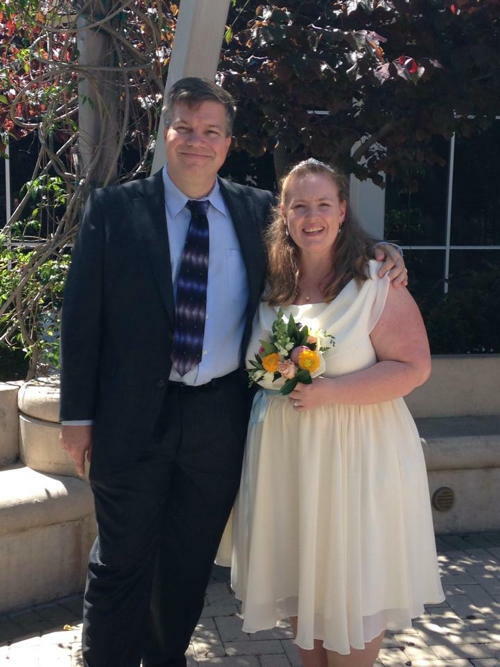 We got married in a 15-minute ceremony at the Santa Clara County Clerk Recorder in downtown San Jose. 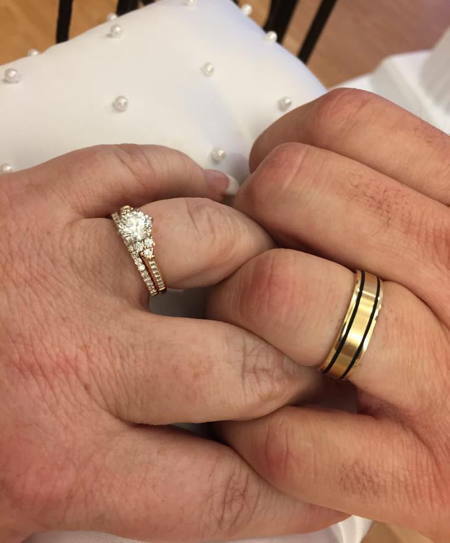 I went in over Thanksgiving break last year to make the appointment, and then we bought rings (picking them up in February), and then last week went in to get the marriage license. We mostly kept things under wraps until sometime in March. Last night our friend Karen flew in from Portland because I think she had to see it with her own eyes to believe it. We wanted to have a low-key event so we didn’t really encourage people to fly in for it. So Karen was the only out-of-towner we expected. Debbi took half a day off to pick her up, and they hung out at home for the afternoon. I gave her one frivolous little gift, a tiara which I thought she might wear for dinner after the ceremony. In fact, she wore it almost the whole next day! The next morning we got up and drove to Sprinkles to pick up three dozen cupcakes for dinner in the evening. Then we went to the Crepevine downtown where several of our friends met us for brunch. Back home we started changing for the 2 pm ceremony. The doorbell rang and I went down to see who it was, and we got the biggest surprise of the day – Debbi’s sisters flew in from the east coast for just the day to come to the ceremony and to dinner! It was nuts – Debbi couldn’t believe it! We got to show Janine our house, and Dianne found the cookies I had baked a few days earlier. 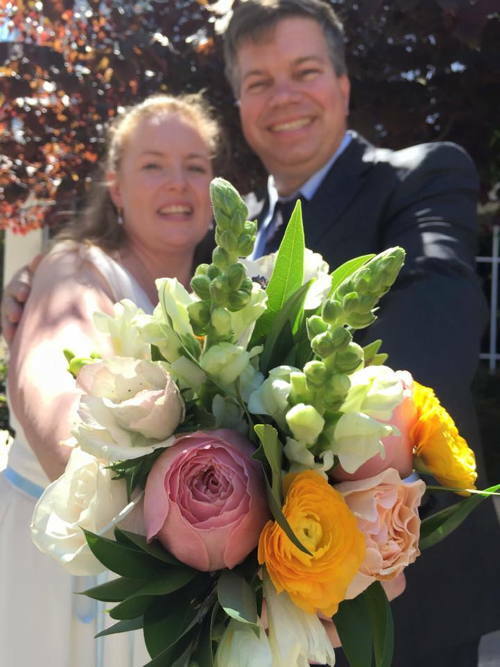 We happened to get the same woman, Tina, who had sold us our marriage license the week before, to officiate the ceremony, and she was a lot of fun. I think we had 10 people at the ceremony, so we ended up with lots of pictures, including a bunch in the courtyard outside afterwards (where we didn’t linger too long because the mercury hit 90!). K in particular took a bunch of great photos that I need to get from her at some point (besides the ones up on Facebook). I thought Debbi was going to be fighting back the giggles for the whole ceremony – neither of us are very comfortable being in the spotlight like that. Debbi decided to wear her dress for the rest of the day, but I changed out of my suit when we got home and hung out for the afternoon. For dinner we invited a bunch of friends out to our traditional anniversary restaurant Don Giovanni where we were seated in their new(ish) banquet room we’d never been in before. It had some space for the kids to run around in, and a couple of good-sized tables. We were able to talk to most of our guests during the night. And my credit card company didn’t put a fraud alert on the card when I paid for it all! Yay! Debbi’s sisters headed back to the airport a little after sunset (they spent less than 12 hours on the ground in California), and people gradually filtered out as dinner wound down. We came back home with Karen – who’s heading back home tomorrow – and we collapsed ourselves. All in all I think it was just the wedding day we’d been looking forward to. And now on to the rest of our lives. Author Michael RawdonPosted on 30 April 2015 6 May 2015 Categories Personal6 Comments on Married!